I was going to post a daily painting, but the photo of it has so much glare that it will need to be re-photographed. 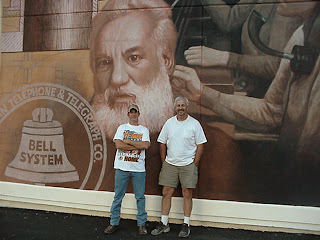 For today I decided to show you a mural I painted back in 2001 (could it really be that long ago?) on the side of the Bell headquarters in Ely, Nevada. The mural is a tribute to the history of Telecommunications--from the invention of the telephone by Alexander Graham Bell, to the current age of fiber optics. My son Jared helped on this mural, and in the second photo we're standing next to it. Contrary to what you might think, I include this shot not to show off my knobby knees, but to convey a sense of scale. How wonderful! The next time we pass through Ely I can tell my husband I met the artist who did that! That is an amazing fete of work, Don. I can't imagine working on that scale, but it certainly told the story. How did you come up with the idea and the models? It must have taken some time to graph it out not to mention the process of painting. Did your son help you? Thanks a lot, Marcie. The prep for the murals almost always takes much more time than painting them. It starts with a lot of research on the topic, as well as image searches on Google and through image banks, books, magazines, etc. I then do rough sketches of design ideas. I sometimes enlist myself, friends or family members to pose. I then get my image reference into Photoshop and use that to design the murals. It's a great tool to move different elements of complex designs around, resize, etc, without having to re-draw everything all the time. Yes, my son helped with all aspects of painting the mural. He would often underpaint areas, then I would come along and add finishing touches.